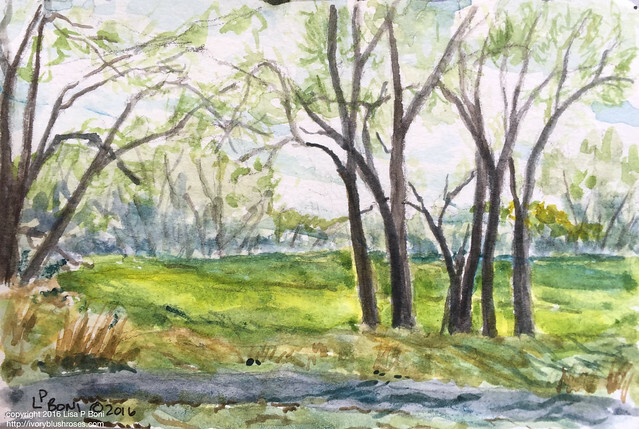 A stop at the Rocky Mountain Arsenal National Wildlife Refuge yesterday morning on my way home from work resulted in this little watercolor sketch! Loved the morning light streaking across the grassy areas and how the dark tree trunks and haze of new leaves contrasted with it. Too windy to see much in the way of wildlife. Although I was blessed to see something just as I was leaving, which I'll share at the end of this post! 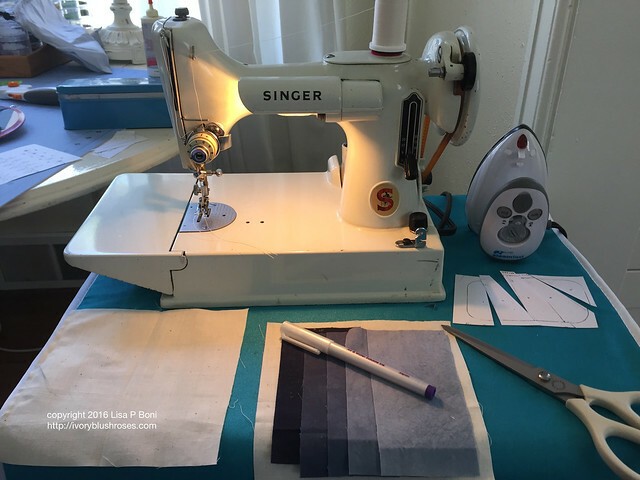 After much fiddling, I finally got my new (to me) little featherweight sewing machine up and running well! Recently, I also acquired a tiny steam iron. With an ironing mat, the whole works fits on a folding wooden TV tray table! Perfect! I keep dreaming of downsizing to a tiny house of some sort, whether I actually end up building my Rosebud Cottage, or try RV living at some point, I've been wanting to get things down to smaller sizes. With this little set up, I feel like I'm on my way! I've been doing a lot of stitching, but on things I cannot share yet. To warm up on my stitching days, I've been piecing together patches for "Mollie Feathers". Slowly but surely! 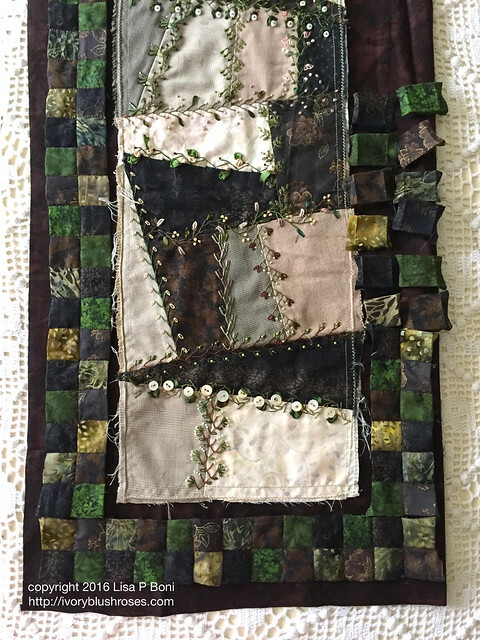 Hoping to have this assembled soon so that I can begin the decorative stitching on the borders! Back to the Rocky Mountain Arsenal NWR. 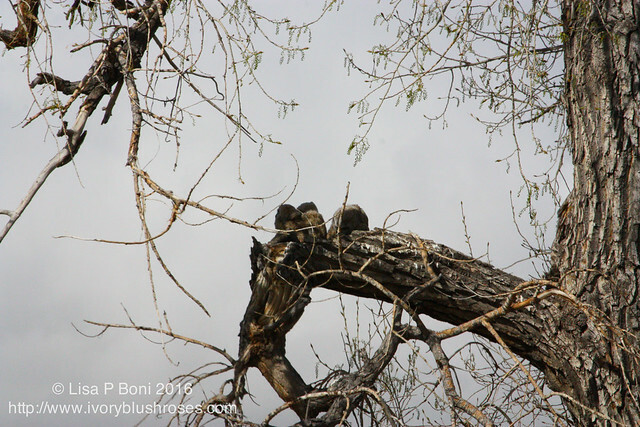 As I was leaving, I scanned the trio of large cottonwood trees near the entrance. The adjacent property is undergoing massive earthmoving in preparation for development and many were concerned that they would rip out these trees, which are known for the great horned owl nest that they host. Thankfully, though they have moved dirt within just a couple of feet of them, they spared the trees, at least for now. I wasn't sure there any activity in them this year. But then, I spied that bumpy "knob" on the curve of the branch! 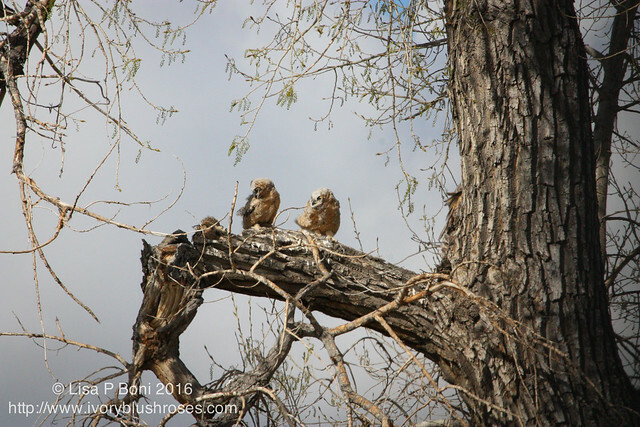 Those knobs turned out to be three great horned owlets, near to fledging! And if you look at the left side of the main trunk, you can get a glimpse of one of the adults feathers blowing in the wind! So delightful to see them! Sadly, the owl pair that used to nest in my neighbor's tree has had a difficult couple of years. One of the adults was killed last autumn after losing both owlets in the nest in the spring. I have on occasion seen an owl in the area since then, but not nearly as often as before. How lucky you were to see the owlets... My rotten neighbor shoots owls because he thinks they kill his barn cats. I was without GHOs for a year and was overrun with wild rabbits.. I again have a pair and their evening hoots are music to my ears. I also have a resident barn owl and know we have a saw whet but have only seen one. Seeing an owl is such a rare thing - at least it is here. Lucky you to see the babies! Your crazy, it's a great work. Sorry for my bad english, i'm not speaker. What sweet owlets and I love the little piece you are working on. I have been absent, just catching up and oh I love seeing all the spring flowers. It's been so gray, cold and gloomy in MI and I have no yard:( So it's a real treat to see everything. I love, love, love the featherweight and in such beautiful condition!! Never knew there was yellow holly and I loved the magpie up close. So good to be back and catch up with your inspirational blog. Lovely watercolor and fantastic to see the owlets. What a treat!